Talk about a recipe that lives it to its name! This glorious chicken dish perfumes the house with a wonderful aroma of spices—ginger, curry, cloves and cinnamon. And then, when you bring it to the table and serve it over some cardamom-scented Basmati rice, it proves to be as delicious a taste as it is an aroma. Its Indian pedigree is fascinating. 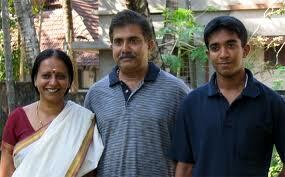 It comes from Kerala, the state that’s almost at the tip of the Indian sub-continent. 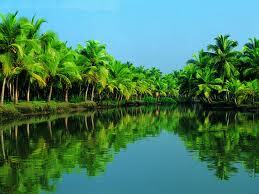 From the look of it, Kerala lives up to its name, which means “Land of Coconuts”. Kochi, formerly known as Cochin, is its capital and there you’ll find this dish’s creator and her eponymous cooking school. Nimmy Paul is her name and her background is as complex as India itself. Nimmy Paul was ‘discovered’ by the great New York Times reporter and food writer R.W. Apple. He and his wife Betsey happened upon the tiny school and put it on the map in 2004. Nimmy is married to Paul and together with their son Joseph, they open their home to small classes; their kitchen size can’t handle bigger ones. 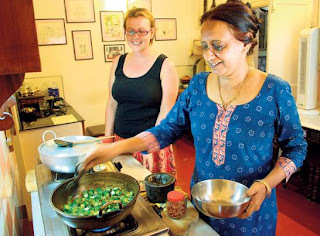 Nimmy Paul’s cuisine is truly her own. Nimmy’s background is Syrian-Christian. Apparently, America is not the world’s only melting pot. In Kerala, Syrian Christians represent a substantial minority and there are few dietary restrictions. What results are recipes that are rich in spices and, as in so many hot climates, these can involve a fair amount of heat. Andrew and I like heat. But I would have to say that Nimmy’s chicken recipe isn’t the spiciest Indian food we’ve enjoyed. And if spice is a problem on your table, the elimination of the Cayenne pepper should pretty much eliminate the problem. Toss all ingredients except water, oil, onion, and flour and rice with 1 teaspoon salt in a wide heavy medium pot. Marinate chicken, covered and chilled, 1 hour. Add water and bring to a boil, then simmer, covered, until chicken is tender, 40 minutes to 1 hour. Meanwhile, heat 1 1/2 inches oil in a small heavy saucepan over medium heat until hot but not smoking. Toss onion with 1 teaspoon flour, then fry in 2 batches, stirring frequently (do not let burn), until golden brown, 2 to 3 minutes per batch. Transfer with a slotted spoon to paper towels. Reserve 3 tbsp. oil. Remove chicken from cooking liquid, reserving liquid, and gently pat dry. Heat reserved oil in a 12-inch heavy skillet over medium-high heat until it shimmers, then brown chicken all over, about 6 minutes total. Transfer to a platter. Add remaining 2 teaspoons flour to fat in skillet and cook, stirring, 1 minute. Add chicken-cooking liquid (with aromatics and spices) and simmer, stirring, until slightly thickened, about 2 minutes. Season with salt and pour over chicken. Top with fried onions. Serve over basmati rice, removing cardamom pods if you wish.